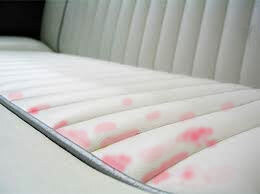 Pinking is a stain which occurs on vinyl fabric and is bright pink or red in color. It is caused by the natural metabolic by-product of a specific strain of bacteria that flourishes in marine environments. and is the pigment or dye from the organism and not the bacteria itself. 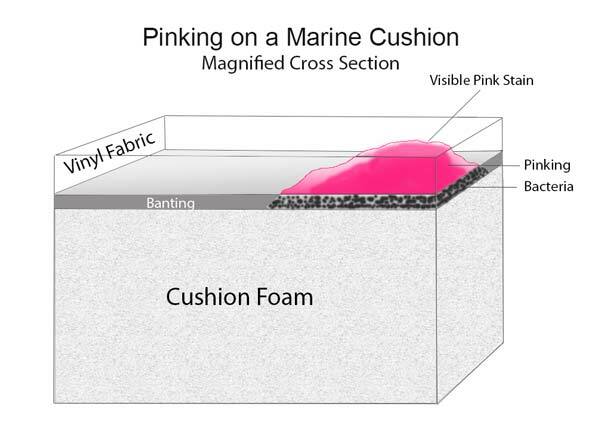 When this strain of bacteria finds its way inside a marine cushion between the foam and the vinyl fabric (see diagram below), and can also access enough water and food in a warm environment, then it can grow a colony of sufficient size to cause visible staining. Normally, by the time staining is visible, the colony of bacteria that produced it is dead or near dead. The size of the molecule from the bacterial Pinking stain is so damaging because it is just the right size to work its way through the natural matrix of the PVC or Vinyl material. This is why these stains are impossible to remove using traditional methods because the stain is “wicked” from the bottom of the vinyl, where the colony of bacteria live, to the very top layer of the vinyl. The only way to permanently remove the pinking is to remove it all the way through the cross section of the vinyl. The bacteria which causes pinking can emerge to create the stains in a few weeks and only requires a small amount of oil or other food sources along with moisture in a warm environment to rapidly grow. Pinking is found all around the globe and has existed since vinyl fabric was first made over 50 years ago. Join our partner program and eliminate Pinking for your customers"